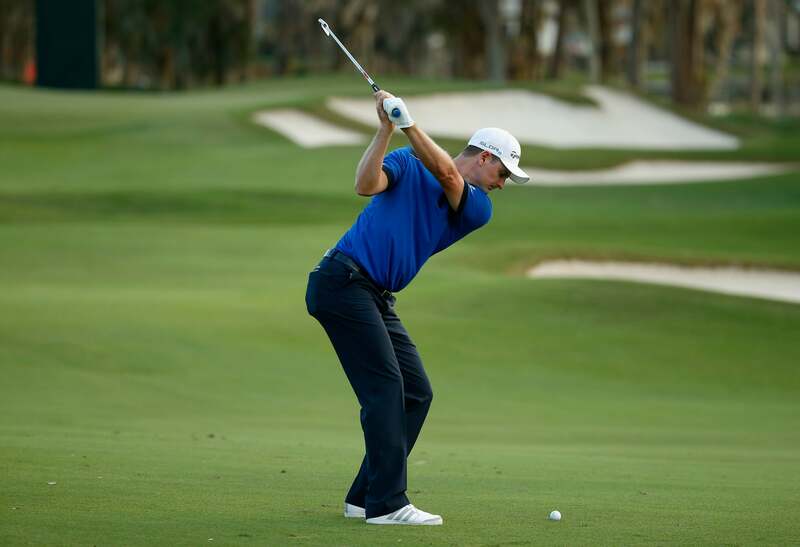 In 2014, Justin Rose ranked fifth on Tour in Strokes Gained on approach shots. POP QUIZ: Which of these shot categories most influences your scores? Within the broad approach-shot category, shots that start 100 to 200 yards from the hole contribute the most to scoring differences. Shots in the 100- to 150-yard range are more important for weekend players, while shots in the 150- to 200-yard category are big for the pros. Skeptical? Well, consider the results of shots that start 150 yards from the hole in the fairway. A 90-shooter hits the green only 35 percent of the time. Half of that player's shots finish more than 59 feet from the hole—that's two and a half times farther than a Tour pro's shots. We can learn more by looking at a 90-shooter's shot pattern starting from 150 yards out in the fairway. You might expect this pattern to be circular and centered around the hole, but it's not. The pattern is oblong and 50 percent longer than it is wide, and its center point falls about 13 yards short of the hole. That means 90-shooters leave these approach shots about one club short of the hole. Distance errors play a bigger role than direction errors. Solid ball-first contact is a key to improving these shots. Clubbing-up is another solution. A 90-golfer's shot pattern on a 150-yard shot from a tee box is different. It's a more circular shape, about as long as it is wide, so distance and direction errors are nearly equally important. The 90-shooter's shot pattern on a typical 150-yard par-3 hole is much tighter than the pattern created by the same golfer hitting from the same distance in the fairway. Two factors contribute to this: Golfers are better at club selection from the tee than they are from the fairway, and they benefit from using a tee. So always tee it up on par 3s. We know that a 90-shooter's approach shots aren't as good as those of an 80-shooter. What's surprising is how much these shots contribute to scoring differences. A great way to lower your score is to choose the right club and to improve your contact on these all-important approach shots. I asked my friend and Golf Magazine Top 100 Teacher Chris Como for advice to help golfers like you with their 100- to 200-yard approach shots (see below). Chris has helped amateurs and several Tour pros alike, and I think his advice will help you improve your game, too. To create more solid contact and better approaches, start by making a nice full turn on the backswing while keeping your head and the upper half of your body relatively centered. The feeling should be one of turning, not swaying. Feel the pressure in your feet shift from the inside of the right foot on the backswing to the left foot on the downswing. Chris Como is based at Gleneagles Country Club in Plano, Texas.